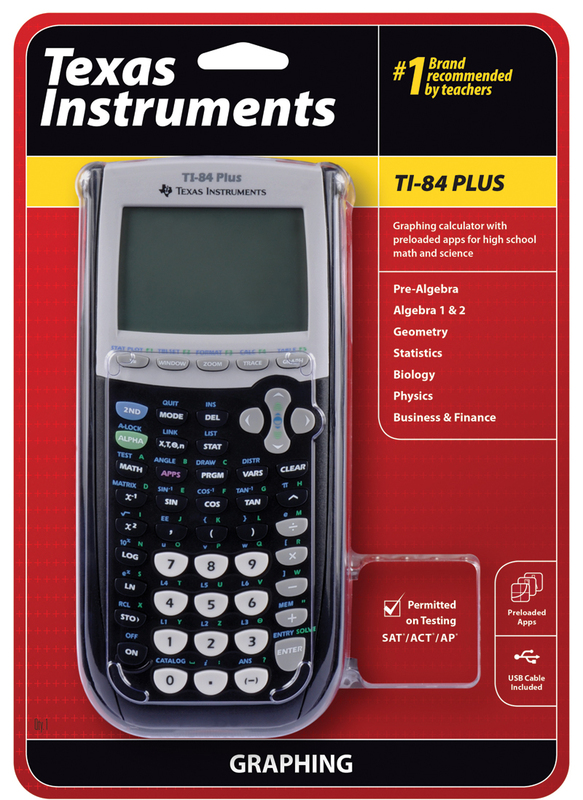 New Texas Instruments TI-84 Plus Graphing Calculator 10 Pack - Retail Packaging - With 1 Year Warranty. Building on the hugely popular TI-83 Plus, which is perhaps the best-selling calculator of all time, the TI-84 Plus is completely compatible with its predecessor. From that well-established platform, this new model adds more speed (a processor that's 2.5 times faster), more memory (24 KB RAM and 480 KB of Flash ROM), an enhanced high-contrast display (eight lines by 16 characters), and more beloved Apps. Includes a USB Port and cable. It also adds USB on-the-go technology (cable included) that can be used to share files with other calculators or to connect to PCs or optional presentation tools. Comes with 13 pre-loaded Apps and supports all TI-83 Apps. Thirteen Apps are pre-loaded, including Cabri Jr., CBL/CBR, Conic Graphing, Inequality Graphing, Probability Simulations, Science Tools, StudyCards, TimeSpan, Topics in Algebra 1 Chapter 5, Topics in Algebra 1 Chapters 1-4, Transformation Graphing, and more. For students in math and sciences, the TI-84 Plus is a powerful, problem-solving tool with features for storing, graphing, and analyzing up to 10 functions. Plus, it displays graphs and evaluates tables on a split screen, allowing you to trace the graph and scroll through table values simultaneously. Split screen lets you view a graph and its equation at the same time. With the TI-84 Plus, you can view an equation, its graph, and the coordinates all at one time. Jump from point to point by entering a number. Several useful plot types are available, including scatter, box-and-whisker, XY-line, histogram, and normal probability plots. Advanced statistics and regression analysis, graphical analysis, and data analysis are readily accessed, along with features for calculus, engineering, financial, logarithm, trigonometry, and hyperbolic functions--all crucial tools for advanced analysis. With its clear display and fast processing, the calculator incorporates graphing tools for mathematics and science course work, including statistics and finance. The included normal slide case is great for desktop work. The TI-84 Plus is powered by four AAA alkaline batteries (not included) and one silver oxide battery (included) for backup, with an automatic shutoff to save energy. It also comes with a hard normal slide case and is supported by a one-year limited warranty. The Texas Instruments TI-84 Plus Graphing Calculator features USB on-the-go technology for file sharing with other calculators and connecting to PCs,handling calculus, engineering, trigonometric, and financial functions, 11 apps preloaded, and displays graphs and tables on split screen to trace graph while scrolling through table values. Advanced statistics and regression analysis, graphical analysis, and data analysis are readily accessed, along with features for calculus, engineering, financial, logarithm, trigonometry, and hyperbolic functions--all crucial tools for advanced analysis. With its clear display and fast processing, the calculator incorporates graphing tools for mathematics and science course work, including statistics and finance.